The wonderful thing about bushcraft is that there is such a thing as a free lunch. In an ever commercialised, sanitised and rushed existanse you can escape, albeit for most of us only temporarily. Better to have the occasional escape though. Is bushcraft an essential skill for most of us? No. Will we have to trap bears in Basildon, or find discover drinking water in Lancaster? Probably not as Evian is available in Morrisons now. That said, there’s little more rewarding than cooking freshly caught mussels on a beach, finding wild garlic to add to a salad, and realising that some things in life are actually free. While you’ll want a few tools. A drinking bottle, something to cook on, eat with, sleep in, and keep you warm, you really don’t need much equipment for bushcraft. That’s not to say you won’t catch a bug and find fun in buying new knives, hammock suspension systems, parangs, and various odds and ends, but that’s choice. You really only need a few essentials. 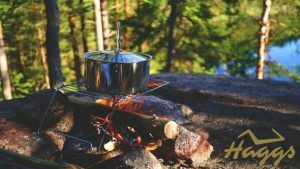 Once you’ve purchased those essentials, the cost of a holiday is limited to a camping site if you use one (you may wild camp), your food, and the cost of travelling. Lots more to follow… but site still in build mode. Bear with us!